What conditions does DDAVP Ampul treat? Seek immediate medical attention if any of these rare but serious side effects occur: chest pain, weakness on one side of the body, slurred speech, sudden vision changes. List DDAVP Ampul side effects by likelihood and severity. Before using this medication, tell your doctor or pharmacist your medical history, especially of: high or low blood pressure, heart disease (such as blocked blood vessels in the heart), conditions that may increase your risk of fluid/mineral imbalance (such as cystic fibrosis, heart failure), the urge to drink too much water without being thirsty, history of blood clots. This drug may make you dizzy. Do not drive, use machinery, or do any activity that requires alertness until you are sure you can perform such activities safely. Limit alcoholic beverages. Alcohol can also interfere with how well desmopressin works. What should I know regarding pregnancy, nursing and administering DDAVP Ampul to children or the elderly? 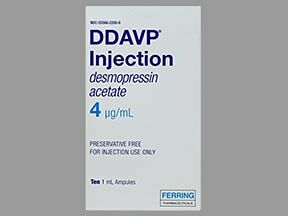 Does DDAVP Ampul interact with other medications? 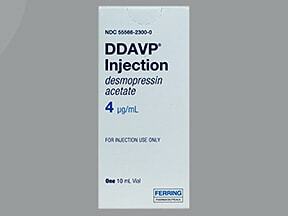 Are you taking DDAVP Ampul? Are you considering switching to DDAVP Ampul? How long have you been taking DDAVP Ampul?